The Fiat Ducato is a popular panel van and good for camper van conversions. The Ducato chassis has long been used by motorhome builders. The Fiat Ducato is the same van as the Citroen Jumper and the Peugeot Expert, with all three vans being made in factories in Italy and Brazil. Ducato’s are reliable and well made. Parts are easily available and well priced. 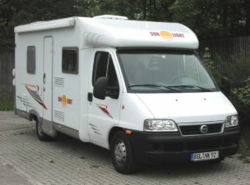 The Fiat Ducato is popular base vehicle for camper van conversions. 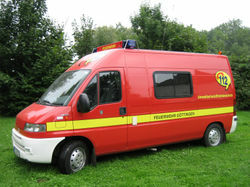 Ambulance versions of the Ducato are available, and a good choice for a camper van conversion. The Fiat Ducato chassis is one of the best, and is used in a very high percentage of motorhomes. Goods and passenger versions are still available. Carrying capacity was increased from previous models. Peugeot changed their van name to Boxer and Citroen to Jumper. 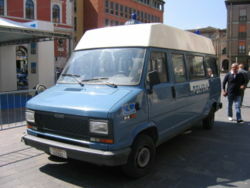 Initial Fiat 2.5L diesel engines were replaced with 2.8L Iveco engines in 1998. The Ducato had a choice of four engines; 2.0L petrol, 2.0L JTD, 2.3 JTD 16v and a 2.8 JTD. Manual and automatic gearboxes are available. Goods and passenger versions were available. In 2003 the range was restyled. The 2.5L diesel engine was dropped. The Ducato was launched in the 1981 then redesigned for 1993: engines were 2.0-litre 4-cylinder petrol or 1.9 diesel. Hi, I am about to buy a Ducato motorhome (1986) but have just found out it needs to be LEZ compliant, the owner doesn’t seem to know what I’m talking about but I have found out the weight on the log boog is 210kg? can anyone tell me if it is compliant or not? Battery warning light comes on with engine running. But goes out when rpm hits 2000 +. Any help would be appreciated. Does anyone know where I can get a brake servo/vacuum pipe for my Ducato 1.9 Diesel 1998. I have been told its the same as a relay/ boxer only with a different badge. I have a 2006 Fait Ducato Tribute. The paintwork is peeling off from the roof, upper section and the bonnet. This, I believe is a common fault with that particular years Silver/Grey models. I would like to get in touch with the Italian d manufactures direct as Fiat UK don’t want to Know. I have a 1997 Fiat Ducato 2.5 Diesel Royale 590 MotorHome. Could anybody please tell me where I can find the ON BOARD DIAGNOSTIC Plug or DATA LINK CONNECTOR Plug. I cannot seem to find it anywhere. i have the battery icon lit up on my dashboard after starting the engine and my leisure battery is charged but will not power any of the appliances any clues how to cure this? The battery light on the dashboard normally means that the alternator is not charging the battery properly. I would disconnect the leisure battery from the engine battery to see if this cures the problem. If not I would check that the alternator is outputting 14.4 volts, as it should. My cylinder head is catastrophically broken. It’s a 1993-4 1.932cc diesel. Can anyone direct me to a replacement?? Sorry to hear about you engine troubles. Finding an engine is often easiest from a local breakers yard. If you are going to fit the engine yourself this is probably the best option, or maybe even look on eBay. If you want a garage to fit the engine it is probably better to speak to the garage first, as they might only fit an engine they have sourced. Can anyone advise on how to change the timing belt on this model. The 2.8l will definitely be stronger. Are you taking 6 passengers in your camper van? If so the 2.8l is the one to go for. For 1 or 2 people the 2.3l will be fine. Had very similar problem + fueling problem. Garage fitted new fuel pump/level unit/throttle potentiometer and spent days trying to find the fault. Cost was astronomical – fault was eventualy traced to the connector converting the loom from left to right hand drive being of crap design and losing continuity over time! Would suggest you remove it and solder the wires together properly. My own now (51 reg Pioneer 2.8 Hdi) needs a new gearbox after only 30000 miles and as Peugeot/Citroen/Fiat refuse to accept that any faults exist with a large number of their gearboxes,despite the entire trade giving evidence top the contrary, i will never buy a French vehicle again. I am living in Southern Ireland and am the proud owner of a very good Ducato camper 1991 sadly, on the way back to Ireland after a truly wonderful trip to the uk the gerabox gave up the ghost. A 5 speed Ducato gearbox in Ireland is actually rarer than hens teeth, can anyone help please? Ive changed the pump, no luck. The tank is fineand vented and the petrol pipes dont seem blocked, BUT when I drive it after about 20 seconds it chugs and tries to konk out. Its been getting worse and worse and now it wont even drive down the street. Im thinking the carb is knackered. Have you checked the fuel filter? If it is dirty then there is a suggestion of dirty fuel. Have you checked the jets in the card to see if they are blocked? How easily does the engine start from cold? hi, I had the same issues with mine as well and the RAC said its a common fault as when the engine gets warm the petrol in the fuel pump evaporates, he advised me to fit an electric fuel pump to rectify the issue. hi i have a 1998 2.8l maxi ducato converted into a campervan by myself and i am looking for replacment sills for her may someone knows were i can get pop on sills for self weld or any help please.thankyou in advance.workingdog. I got mine from a Company in Portsmouth, they are called Solent Car Panels and the number is 023 9265 5558 the Guys name was Mike and he was really helpful. Wer kann uns weiterhelfen??? Wir sind auf der suche nach einem Ruecklicht hinten rechts, leider ist auch die Ecke in Mitleidenschaft gezogen. Gibt es die Ecken einzeln nachzukaufen und wenn ja wo. Es gibt leider tausende Ersatzteilhaendler aber fuers WOMO ist es wie mit einem seltenem Oldtimer. Can anyone help me please i have rung over 30 fiat dealers i have been laughted at tried breakers you name it i was even told scrap it,if it was after this year they may be able to help if it is on there records so i am starting to pull my hair what is left of it cheers. I have a Citroen relay hdi & its the same. Seems normal for this engine. I see that Auto Books Direct do a range of Russek manuals. The pricing seems good and it looks like UK P&P is included up front! Has anybody else used Auto Books Direct? Need an engine, 2ltr Petrol, anyone know where I can get one?… My first motorhome, was really enjoying it till knock knock knocking of current engine, many thanks if you can help. Anyone have any luck on find a wiring digram for the ducato? I have a 96 1.9TD CI 500 motorhome and have been searching for data for ages. I currently have no reversing light and MOT is due soon. I have an old campervan that has developed an electric fault, does any know how to get hold of the wiring diagrams or know where the dash board relay switch is located? Thank you for your recent enquiry regarding a Service and Repair Manual for your vehicle. Unfortunately, we do not produce a Manual for this particular model and have no plans to do so within the foreseeable future as we tend not to cover commercial vehicles. Unfortunately as most commercial vehicles are owned by companies there is not a high enough demand for us to produce a Haynes manual. However, all customer requests are recorded and used in the decision making process of future Manual publications/updates. You could try contacting your local dealer to see if he can be of assistance. Dear Haynes Manual team. Please please raise the priority of a manual being produced for the Fiat Ducato. Mine is a 1996 camper van. 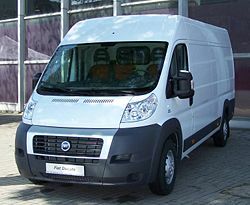 Although there’s a tendency these days for lots of cars to be dumped after 15yrs old, I know for a fact people will want to keep Fiat ducato vans on the road for many years more than that. Just check out the sheer number of camper vans based on the Ducato in “MMM motor caravan” magazine! Nancy and I have just taken delivery of a 1996 Ducato motorhome and will need a manual at some time in the future and would prefer to buy one before it’s needed. I have come across your request for this manual. We have the same vehicle. Did you ever find the book or CD about it?